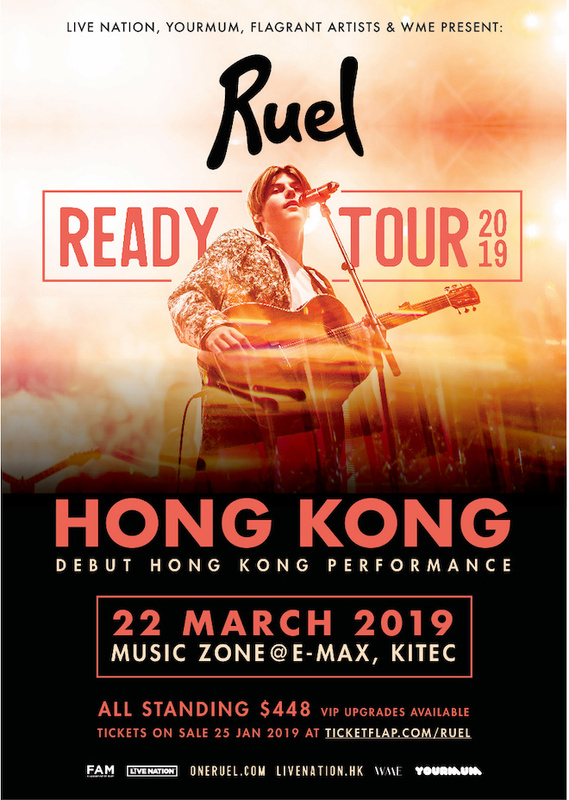 Live Nation and YourMum are thrilled to jointly present Australian’s young rising star Ruel to perform in Hong Kong for the first time on 22 March at Music Zone @ E-Max, KITEC. Standing tickets at HKD 448 will be publicly on sale 25 January (Friday) starting 10am via www.ticketflap.com/ruel. VIP Upgrades are available, please see oneruel.com for details. Live Nation members can purchase tickets ahead from 24 January (Thursday) 10 am to 11:59 pm For ticketing info and membership sign up, please visit www.livenation.hk. Not long after the release of “Don’t Tell Me,” Ruel was invited to write with Julia Stone, which led to him supporting Angus & Julia Stone on their sold-out Australian tour. In the same year, Elton John requested an interview with Ruel for his show on Beats 1, praising him: “You have the most amazing voice that I've ever heard from a male singer at 14 years of age and it's quite incredible.” Ruel was then invited to support Khalid on his Australia/New Zealand tour, performing to more than 5,000 people a night. Ready, his debut EP has already amassed over 100 million global streams and features standout singles “Don’t Tell Me,” “Dazed & Confused,” “Younger” and “Not Thinkin’ Bout You,” all of which have been propelling Ruel on a swift, upward trajectory. The video for EP track “Younger” caught fire and has enjoyed over 5.5 million views since its release in August, with “Younger,” “Dazed & Confused,” and “Don’t Tell Me” all certified Gold in Australia. 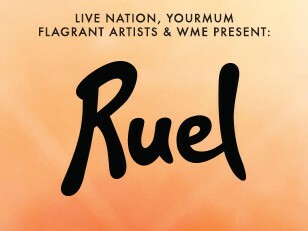 Having wrapped 2018 on a major high, Ruel became the youngest recipient in history to win the prestigious Aria Award for “Breakthrough Artist of the Year,” he performed at the opening ceremony of the Commonwealth Games, released a remix of EP track “Not Thinkin’ Bout You” featuring Grammy-nominated rapper GoldLink, performed at Tyler The Creator’s “Camp Flog Gnaw” festival, and completed very own sold out “Ready World Tour” through North America, Australia, New Zealand, Europe and the UK. Ruel is just getting started.